Is the stl for that mks 1.4 case available by chance? Its exactly what im looking for and has the mount points to attach to 3030 extrusions! 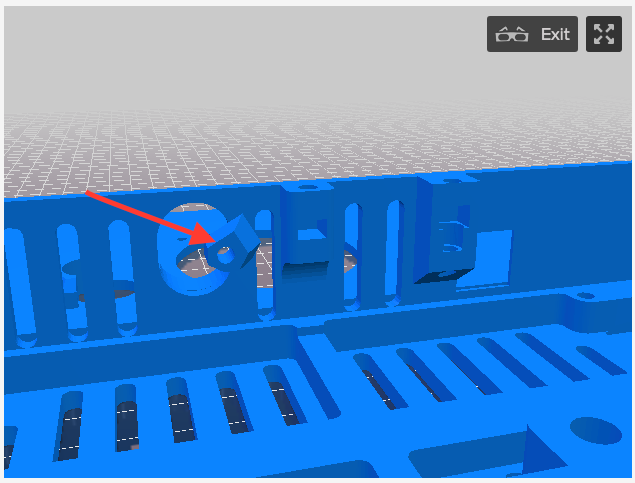 I havent been able to find a good one for extrusions on thingiverse. Thanks in advance! The graphic lcd won’t work in prusa fw. Too much code has been removed. There isn’t the code space left for it. As an aside, personally I don’t see the point. The software spi update cycle uses up a large percentage of cpu cycles leaving much greater risk of glitches and issues while printing. All you get in return is a little drawing of an extruder. Sorry for the slow reply, I’ve only just seen this. I’ll check to see if I still have the design files and if so, I’ll upload it to Thingiverse for you :). I’ve got a 2.5 upgrade kit arriving soon, do you think it’ll be possible to use the new bed with the current modified firmware? I’m happy to leave out the run out sensor and other bits, as long as I can use the new bed :). I wasn’t sure if the calibration points are a little different and will require a change of firmware to use. Thank you! this is awesome! I love the zip time mounting holes, but what are the hexagon nut looking things in front of some of the wiring holes? what are the hexagon nut looking things in front of some of the wiring holes? I’m not sure which bit you mean, but if you can annotate the image, I’ll be able to help :). Ah, those are for poking the 2.85mm guide filament in to (i.e. the supplied nylon filament to support the cable bundles). Not necessarily required :). We’re taking this thread quite off-topic though, so may be worth carrying on any other discussion in a new thread or on Thingiverse, as I don’t want to derail the firmware discussion. I’ll do what I can to help :). Do you think this one looks like it portable, @slippyr4 - or is this too different? I saw your post about the MK3 firmware, but wasn’t sure if the MK2.5 firmware was closer to the MK2 or MK3 firmware, given the new heatbed. Here’s a first crack at porting the MK3 firmware to RAMPS. it’s very likely that the tmc2130 code is non-functional. i’ve lightly tested this on my own MK2 clone. First off, I want to say that I’m new to 3d printing and have to experience what so ever in electronics. I’m here to learn and experiment. Just so you know, 2 months ago, I didn’t even know what a Arduino was. So I start researching, learned the basic of electronics and how a 3d printer works. So far so good, here where I’m standing now ; I got a fully build mk2 clone and where I struggle is to set up the FW. I don’t have a LCD yet planning to buy one but for now I use Pronterface as a host. I started with Marlin, everything moves and heats as it should. So I know all my components is working. So I started to try to calibrate the printer and set up build dimension/homing procedures. That’s when I decided to switch to this FW. Since I got a Mk42 from orballo I wasn’t able to set a proper Auto bed leveling with the 9 specific points and I want to take full advantage of the Mk42. mode? And what you though on using 1/32…should I use 1/32 on all axis? Hi Cartouche, and welcome. I too am a read and rarely post kind of person, but let me try and help a bit. I highly recommend getting an lcd for your machine, it makes calibrating and setting up the machine easier. You can of course use pronterface’s console to calibrate XYZ with M45 V2 to see why it fails. I’ve built 2 MK2(s) clones so far, one on a prusa i3 bear half upgrade with a china i3 frame, and one on an Orballo p3steel frame (this was a horrible mistake). The bear edition is the same as the mk2s dimensions in theory, and reuses many parts. Tolerances were tight however, i cut the aluminim rails short and had to shim the frame. The geometry of the orballo was such that i had to change the firmware and offset the initial x and y positions to get calibration to pass. (Also Orballo don’t provide stl files for their machines or their gpl source for their forked firmware on their website, pretty sure i will avoid buying from them in the future) Anyway, once you get the XYZ calibration to pass, you can run the v2calibration.gcode to set the nozzle height, but i’m not sure how to live adjust Z without a screen. as for the boards.h define, looks like according to http://reprap.org/wiki/MKS_GEN The mks gen uses the same pinouts as ramps 1.4. Whether the steppers are soldered down or not doesn’t matter just that the cpu pin to function mapping is what the firmware is compiled for. slippyr4’s version and my version should both work as is on mks or ramps boards. As far as DRV8825s and 1/32 go, in theory it should work. i tried it a year ago when i first got my orballo MK42 and i never got it working. The p3steel w/ mk42 that i built has DRV8825’s but i don’t remember if they’re set for 1/16 or 1/32. I strongly recommend getting it working at 1/16th first and the try changing that later. The initialized array that has micro stepping denominators that you’re probably referring to is prusa code that is used on boards where the micro stepping is software configurable. For ramps and mks the microstepping is set by jumpers on the board, so the microstepping only comes into play when calculating the steps per mm for your axes. I just bought the mk42, thermistor and Pei sheet from orballo. My frame is a 6.35mm (1/4’’) aluminum and is handmade. So for sure that I will need to play with off set in the FW to get it working. Just hoping that its not to way off so It would pass self test. Once my machine works, I think i’ll go for a haribo mod because my frame is far from being perfect and this build looks quite robust. I’ll print my self parts for it…eventually XD. they can be found pretty much anywhere from ~$7 to ~$14, and they’re all pretty much the same. some of the smart displays have a big potentiometer then you can’t slide the as example prusa case on it.